It seems like the weekends are getting shorter and the weeks are getting longer. Heck, I can't believe that we are already into August and it is already the 8th. Where has the time gone? Friday after work I headed straight to get a pedicure. My toes were looking super rough and needed some tlc. After spending an hour and a half with Kelly, my toes were bright sparkly red and looking amazing. I grabbed a quick sandwich and then headed to Target to get some stuff for the girls' first day at daycare. I can't believe they started a new school this week. I was heading home and Rory called to say the girls just went down for their naps since they wouldn't go down for his parents. Ugh. I thought about staying out and shopping, but I wanted to see the girls before going out that evening. I got home and they were asleep. They slept most of the time I was there, but got up in time for me to make them a quick dinner and then I headed out to meet my girlfriends for happy hour and to celebrate my birthday. We had wine and appetizers and caught up. The weather was perfect and we had a great time. Then a couple of us headed to The Eddy for another drink and more chatting. I ended up going home at 10 pm and it was such a great evening out. Saturday morning we went out to breakfast and then ran to Target again so I could look at the Fitbit Charge 2. I had been doing a lot of research between the iWatch Series 2 and the Fitbit Charge 2 and after deciding that I want a more fitness focused watch, I got the Fitbit Charge 2. Maybe I will get an iWatch at a later time. We came home and I got my Fitbit set up and the girls were running around like crazy girls. We had our TV installed and mounted and the girls were fascinated by it all. Plus we had someone who lived a few streets away come by saying if we saw her pet skunk to please let her know. She said he had the scent taken out, was declawed and what not. So crazy that someone has a pet skunk. We got the girls down for their naps and then had two and a half hours of quiet time. It was so nice. I ran to Costco to get pull ups for daycare and then came home and they were still asleep. Once they got up, we had some snacks and got them ready to go to Rory's cousins birthday party. We went to the party and had a blast. There was storms rolling through, but the girls and Rory went swimming, we had bbq for dinner, drinks outside and great talks. We were there from 5 to almost 9 pm. Way past the girls bedtime. This was as the storm rolled in. Avery was cold! Cuddling with a cousin of theirs. Sunday we woke up, lazied around the house some and I did some cleaning. Then we headed to a later breakfast followed by some park time even though the girls were acting like crazy girls. These terrible twos are tough and I heard it only gets worse when they turn 3. We got home in time for naps and the girls went down easily. Though they only slept for an hour nad a half. The thunderstorms were rolling back in and Walter was getting scared. We hung out, played and did some yard work. I also ran to the grocery store and then my parents came up at 4:30 to cut the girls bangs. It is so much easier to have my mom cut the girls bangs until we want to go get them full cuts. The girls love their grandma and hate getting their haircut, so this is the easiest option. Then we headed out to dinner for my dad's birthday. 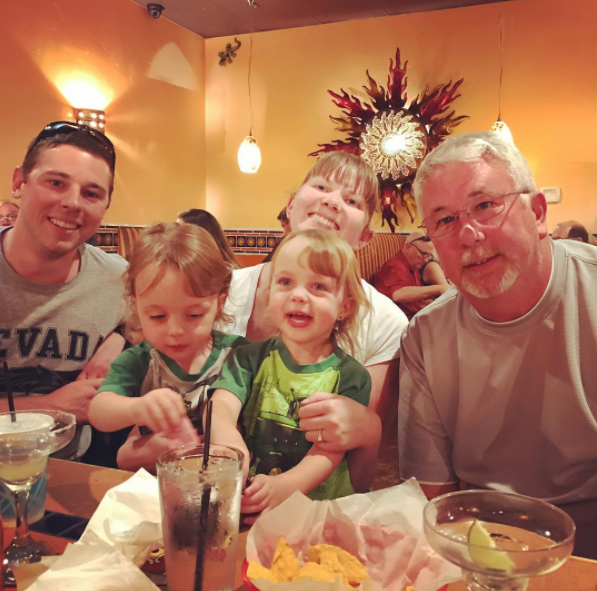 We went to Mexican food with my family, my mom, dad, sister and future brother-in-law. We dined on margs, chips and salsa and Mexican food!!! So good. Happy Birthday Dad! We left and took a drive around town to see the fire going on and just kill sometime before the girls bedtime. Once we got home the girls went down easily and we watched some tv before heading to bed. what a fun weekend! the girls looked like they had a lot of fun at the party and swimming! Glad you have a great weekend!! Mmmm Mexican! It was funny reading about the thunderstorms for you guys this weekend, as we are having some right now. It set the tone. Sounds like you all had a great weekend, even if you are dealing with some terrible twos peppered in there. I heard the same thing about three. A pedicure and happy hour sounds like the perfect birthday treat! Sorry about the terrible two's and the weather, but sounds like a fantastic weekend despite that. Mexican food is always the best for a birthday! You'll have to do a post on how you like your new Fitbit. My Garmin died this weekend so I'm determined to go out & get something Saturday. I feel lost without something on my wrist. Danielle, the girls are absolutely gorgeous. That picture that you posted of them sitting in front of their BBQ dinner the other day made me swoon! Those gorgeous eyes, rosy cheeks, and full lips! Tell Rory to get extra locks on the doors because the boys are going to be beating down the door when they get older! Yay for getting a fitbit. Nice photos! lol at the pet skunk! I'm getting a much needed pedicure on saturday and I can't wait! What a fun weekend. I have a fitbit and love it. I'm sort of obsessed with getting as many steps a day. The twins are so adorable.